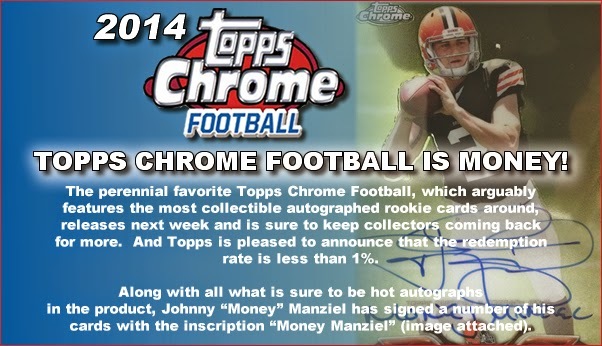 Want 2014 Topps Chrome in your hands Wednesday at 1:00 for only $64.50 per box? Preorder TODAY for this price guarantee. Prices could go up on Monday subject to demand and availability. So go to Sports Cards Plus TODAY and lock-in on $64.50; then pick your box from the BEST CASES in the Hobby on Wednesday. Topps Chrome is a fan favorite every year when it comes to rookie autographs. Each box will have one rookie autograph with the possibility of hitting rare refractors. There will be 24 packs with four cards in each pack. The rookie autograph parallels will consist of Refractor (numbered to 150), STS Refractor (numbered to 99), BCA Refractor (numbered to 75), Black Refractor (numbered to 25), Pulsar Refractor (numbered to 15), Gold Refractor (numbered to 10), Red Refractor (numbered to 5), and Superfractor (1-of-1). In addition, there will be Dual and Triple Rookie Autographs, as well as Rookie Autograph Variations. Collectors could also find Rookie Autograph Patches. There are a number of inserts and autographed versions that feature older designs such as 1963 Topps Minis (1 in 12 packs), 1985 Topps Football (1:6), 1965 Topps Football (1:24). The 1963 and 1985 inserts will feature multiple inserts, and autographs numbered to just 15 copies each. The 1965 design’s only parallel is a Superfractor. Veteran autographs will also be seeded into the product, which are numbered to just 10 copies each. Collectors will find just one Chrome Rookie Die-Cut in every box with the possibility of Blue Wave, Red, and Superfractor parallels. The Rookie Die-Cut Refractor Autographs will be numbered to 15. When it comes to inserts, the 1,000-Yard Club and 4,000-Yard Club are back with Red, Blue Wave and Superfractor parallels, along with Red Refractor Autographs. There are 220 cards in the base set with 110 veterans and 110 rookies. Topps is also adding 25 Rookie Card variations and 30 veteran card variations. The base set will also have more than 10 parallel refractors: Refractor, Blue Wave (one per box), STS-bordered (numbered to 499), BCA-bordered (numbered to 399), Pulsar (one per box hobby box), Black (numbered to 299), Blue (numbered to 199), Sepia-tone (numbered to 99), Gold (numbered to 50) Red (numbered to 25), Superfractor (1-of-1), and Printing Plates (1-of-1).